Missed our program? The next best thing to being there is buying the DVD. Your enrollment in the DVD MCLE training course will help the Downstate Illinois Innocence Project with future continuing legal education programs. Call Rhonda Keech at (217)206-7989 to order the DVD. The Illinois Supreme Court has accredited this DVD program for Mandatory Continuing Legal Education (MCLE) credit. Touch DNA is one such improvement that is on the cutting edge of DNA technology. Pioneered by forensic scientists Richard and Selma Eikelenboom in the Colorado case of Timothy Masters, their sample recovery methods for isolating skin epithelial cells of a perpetrator from a crime victims clothing in a twenty year old murder case led to the recovery of three full DNA profiles. All three profiles matched an individual who was on a short list of suspects in the original investigation. Faced with this evidence in January of 2008, prosecutors agreed to vacate the conviction of Masters. His case was recently featured on CBS 48 Hours Mystery. The Touch DNA testing results in the Masters case has drawn the interest of law enforcement and prosecutors, as well. They recognize Touch DNAs potential for solving cold cases. Since the Masters case, Colorado law enforcement authorities decided to use Touch DNA in the unsolved case of Jon Benet Ramsey. Her parents, ten years ago, had been wrongly suspected of the murder by Boulder police. Re-testing of the victims clothing revealed full DNA profiles in the areas of the clothing where the crime perpetrator grabbed hold of the clothing of Jon Benet Ramsey. These test results may someday lead to the identification of her killer. The Downstate Illinois Innocence Project has applied for a federal grant to conduct a comprehensive post-conviction DNA testing program in Illinois. The grant is funded through the US Dept. of Justice Post-Conviction DNA Testing Grant Program. Congress has authorized 25 million dollars for the Bloodsworth Grant program over a five year period. The Bloodsworth Grant, named in honor of Kirk Bloodsworth, the first DNA death penalty exoneration case in the US in 1993, will provide funding for DNA laboratories to conduct testing, to hire investigators to locate evidence, and to retain the services of private attorneys to represent indigent inmates in filing post-conviction DNA testing motions. Timothy Masters The case of Timothy Masters: A police detectives pursuit of justice frees an innocent man. Bill Clutter Illinois post-conviction DNA testing statute and the Bloodsworth Post Conviction DNA Testing Program. Linda Wheeler-Holloway: Linda currently works as an investigator for the Office of District Attorney in Fort Morgan Colorado. In June of 1991, Linda was assigned as the lead detective for the Ft. Collins police departments homicide investigation of the 1987 murder of Peggy Hettrick. A cold case investigation, the prime suspect four years later was Timothy Masters, who was by now a young man was serving in the US Navy. A year later, in 1992, Ft. Collins police issued an arrest warrant for Masters. After interviewing Masters, Holloway had doubts that he was involved. She decided not to arrest him. After she retired from the police department, another detective took over the case and continued to pursue Masters as the prime suspect. The case continued to haunt Holloway after Masters was convicted and sentenced to life in prison in 1999. While traveling in Holland on vacation in 2005, Linda Wheeler-Holloway discovered the pioneering work of forensic scientists Selma and Richard Eikelenboom and their ability to recover skin epithelial cells of a perpetrator from the clothing of a crime victim. When she returned to Colorado, Linda contacted Timothy Masters attorneys and told them about using touch DNA testing. The results of this testing exonerated an innocent man. Selma Eikelenboom: Selma is a forensic medical expert. In 1999, she became the Forensic Medical Examiner for Amsterdams Municipal Medical and Health Authority. She later worked in the crime scene investigation unit for the Netherlands Forensic Institute Department of Biology. She worked closely with European law enforcement authorities and the judicial system. In 2003, she formed her own company, Independent Forensic Services, a private laboratory in the Netherlands that specializes in recovery of trace evidence and Touch DNA testing that she operates with her husband Richard. Richard Eikelenboom: Richard is a forensic scientist specializing in trace evidence recovery and bloodstain pattern analysis. He also worked for the Netherlands Forensic Institute Department of Biology. In 2005, he joined Selma as a partner at Independent Forensic Services. Richard and Selmas work on the Timothy Masters case pioneered the use of Touch DNA sample recovery methods in the US. The Masters case was the first exoneration case in the US to utilize touch DNA. Barie Goetz: Barie is a forensic scientist specializing in crime scene reconstruction and bloodstain pattern analysis. He worked for the Indiana State Police and the Colorado Bureau of Investigation Laboratory Systems. In 2004, he retired as Director of the CBI Regional Laboratory in Pueblo, Colorado. Barie then started Sangre de Cristo Forensic Services, where he utilizes his 30 years of experience assisting the judicial system in areas of crime scene reconstruction and post-conviction review. He worked as the Forensic Investigator on the Timothy Masters case, reconstructed the series of events of the murder, and assisted Richard Eikelenboom with the recovery of touch DNA samples. Maria Liu: Maria Liu is a founding partner in the law firm of Collins, Liu and Lyons LLP located in Greeley, Colorado. She specializes in criminal defense and post conviction relief. She received her law degree from Southern Illinois University. During law school Ms. Liu worked at the Illinois Migrant Legal Assistance Project and Land of Lincoln Rural Legal Aid. She began her career as a Deputy Public Defender at the Colorado Public Defenders Office. She enjoyed working with indigent clients because they are often the people that need lawyers the most. She served as president of the Weld County Bar Association from 2004-2005. Ms. Liu received the Colorado Criminal Defense Bars 2008 Gideon Award and the ACLUs 2008 Sherman Award for her representation of Tim Masters. Bill Clutter: Bill Clutter began his career as a criminal defense investigator in 1985 working for Springfield attorney Michael Metnick. In 1988, he was assigned to investigate his first case of actual innocence in the Naperville murder case of Jeannine Nicarico. That case was one of the first cases in Illinois in which DNA testing was undertaken. The early DNA test that was conducted by Dr. Edward Blake was a full profile match to serial killer Brian Dugan, corroborating his 1986 confession to the Nicarico murder. This early test conducted in 1988 exonerated Alejandro Hernandez, but was unable to exclude Rolando Cruz. Subsequent improvements in DNA testing technology later exonerated Cruz, as well. Bill Clutters post-conviction in the case of Randy Steidl and Herbert Whitlock that began in 1991 eventually led to their release from prison. Steidl had been sentenced to death and was released in May 2004. Whitlock received a life sentence and was set free four years later. Following Barry Schecks call to create a network of Innocence Projects, Bill met with his former legal studies professor Nancy Ford and Larry Golden at the University of Illinois at Springfield and founded the Downstate Illinois Innocence Project. He currently serves as Director of Investigations for the Project, in addition to maintaining a private detective agency. John Hanlon: John Hanlon began his legal career in 1983 as a staff attorney with the Illinois State Appellate Defenders Office. Shortly after taking that position, John and co-counsel Tim Gabrielsen landed the assignment of defending Rolando Cruz, following Cruzs 1985 conviction and death sentence for the murder of Jeanine Nicarico. In 1988, John and his co-counsel persuaded the Illinois Supreme Court to reverse Cruzs conviction. When Cruz was convicted a second time and sent back to death row in 1990, John recruited a young lawyer by the name of Larry Marshall, a new professor at Northwestern Law School, to work with him on Cruzs second appeal. That was the beginning of the Innocence Project movement in Illinois. The two succeeded in getting Cruzs conviction vacated a second time. The third trial resulted in the dramatic acquittal of Rolando Cruz after it was revealed that two detectives had fabricated a "vision" confession. William Kunkel as appointed as special prosecutor, leading to the indictment of police and prosecutors who were known as the DuPage 7. Johns work on the case of Joe Burrows and Randy Steidl contributed to their release from death row, and the Burrows case was cited by Gov. Ryan when he announced a moratorium on capital punishment. He currently serves as an adjunct professor at UIS teaching a class called Wrongful Convictions. 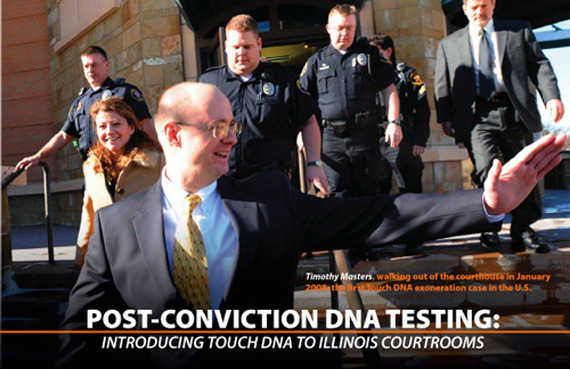 On Nov. 12, 2009, the Springfield law firm of Feldman, Wasser, Draper & Cox filed a post-conviction DNA testing motion on behalf of Thomas McMillen, making the first request in Illinois for Touch DNA testing. They have donated their legal services to the Downstate Illinois Innocence Project. McMillen, who is serving a life sentence, originally faced the death penalty in 1991 in Sangamon County for the murder of Melissa Koontz. His conviction was based on the false confession of a mentally disabled man, Donald "Goose" Johnston, who claimed to have witnessed the murder. Every major detail he provided to police conflicted with the crime scene evidence. Johnston, who had been the first to face the death penalty, received a lesser sentence and served less than eight years in prison in exchange for his cooperation and testimony against McMillen. Prosecutors also used the testimony of five jail house snitches, claiming that McMillen had confessed to each of the five cellmates.